Chinese Amulet. Ching Dynasty, probably 18th to 19th century. 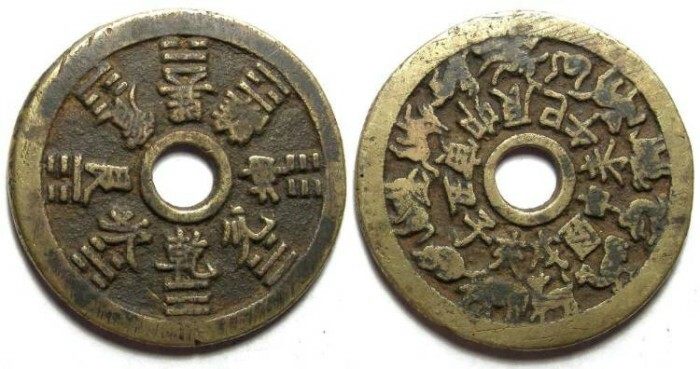 This is not a coin, but rather an amulet which is more like a good luck charm than a coin. Date : The style of manufacturing suggest this amulet was made in the 18th or 19th century. Size : 46.0 mm. Weight : 25.86 grams. Obverse : The 12 animals of the Chinese zodiac arranged in a circle, with them names above each animal. Reverse : The eight trigrams of the Chinese zodiac, with corrisponding characters.